Are you smarter than a 12-year old? Not this one, you’re not! In today’s Gospel from the Holy Mass (Luke 2:41-52) Mary and Joseph find Jesus in the Temple. 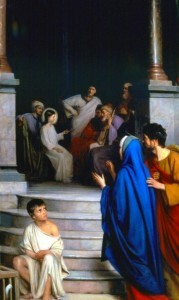 “they found Him in the Temple, sitting among the teachers, listening to them and asking them questions and all who heard Him were amazed by His understanding and His answers.” (Luke 2:47-47). To teach in the Temple, a rabbi (Hebrew for “teacher”) typically had to have years of study under a master; for example, Paul studied for years under Gamaliel (Acts 22:3). Jesus was just a child, but was sitting amongst the teachers. Jesus amazes by His understanding and His answers. Imagine a 12 year old today, sitting with Cardinals of the Church and blowing them away with his/her knowledge of Scripture and the Catechism. Something like this would make for a viral video that would sweep around the planet. Jesus not only understands, but answers questions. When is the last time you asked theological questions to a 12-year old? It stands to reason that one of the sources of Jesus’ great wisdom was the upbringing He was being given by the Blessed Mother and Joseph. Do we strive to teach our children and the children of our parish with the same rigor? Of course the reason why Jesus astounds, is because He is the Word (John 1:1), the Logos, Wisdom itself, for He is the Son of God. It was astounding then and is astounding now. It is clear that Jesus was a genius, beyond the genius of even the most learned men. This should not surprise us, for we believe that Jesus is the Son of God! While we shouldn’t be surprised, we should certainly be in awe of our God.